Ten years ago, there was a different protocol for going four hours down I-85 to watch our beloved Panthers take on the Falcons on their own turf; we were all friends, but we would travel down to Atlanta separately, sit in different areas of the stadium in small groups of two, three, or four (usually wherever we could find the cheapest tickets) and we most certainly didn’t have any effect on the game whatsoever. If we compared our away-game efforts at the time with the fanbases that we saw routinely come through Charlotte and dominate our stadium (Packers, Steelers, Cowboys – I could go on but you get the point), those fans would get As and we were lucky to even be considered an F. It was probably an I – or more like a NE for nonexistent. We decided back then that it was going to be our mission to change the culture of our fanbase, and it started with organizing the small group of friends heading to Atlanta.  And the Roaring Riot was born. Change the Culture. At the time that phrase, to us, meant that we wanted to do whatever it took to convert the stereotypical wine-and-cheese Panthers fan into more of a loud-and-proud diehard fan. To encourage our fans to stand and cheer when the Panthers are on defense and not just on third downs. To convince more PSL owners to attend games or, if they must sell their tickets, to do so to other Panthers fans. To create opportunities to travel as a group to away games so that we can create the largest footprint of black and blue in the stands and therefore have the best chance to be seen and heard, positively impacting the game for the Panthers. The Carolina Panthers fanbase had historically been considered one of the weakest in the entire league, but it was time to take the necessary steps to change that. Since we started using the phrase its message has evolved for me personally. 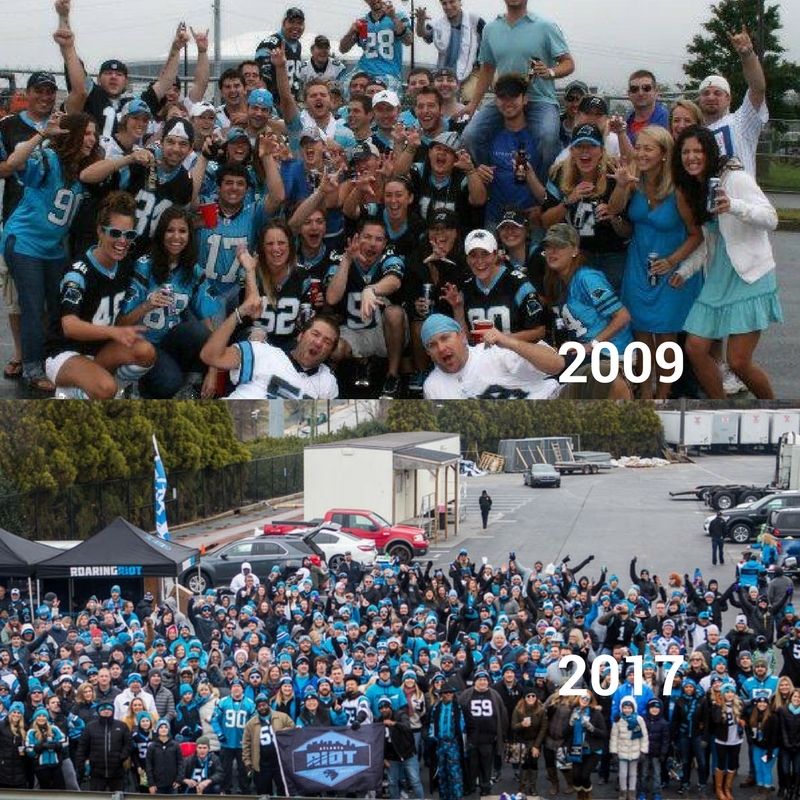 It still encompasses all of its original meaning, but to me, Change the Culture also means that we can be different from the unruly fanbases who don’t have the ability to be loud for their teams without causing harm to others; it means being able to respect our fellow Panthers fans like they’re an extension of our family; it means connecting every Panthers fan across the world, no matter where they’re living, so that they can find other fans and friends with whom to enjoy our team. I spent three years in Philly watching Panthers’ games alone and it was a miserable way to watch the games – let’s make it so that no one ever has to do that if they don’t want to, because football is meant to be shared. This year we’re using the membership shirts as a way to promote the message of our mission and to pay tribute to all of you who are doing your part to Change the Culture, because without your help there is no message and there is no mission. The elements in this year’s shirt are created from using the 2017 members’ names, which numbered over five thousand. 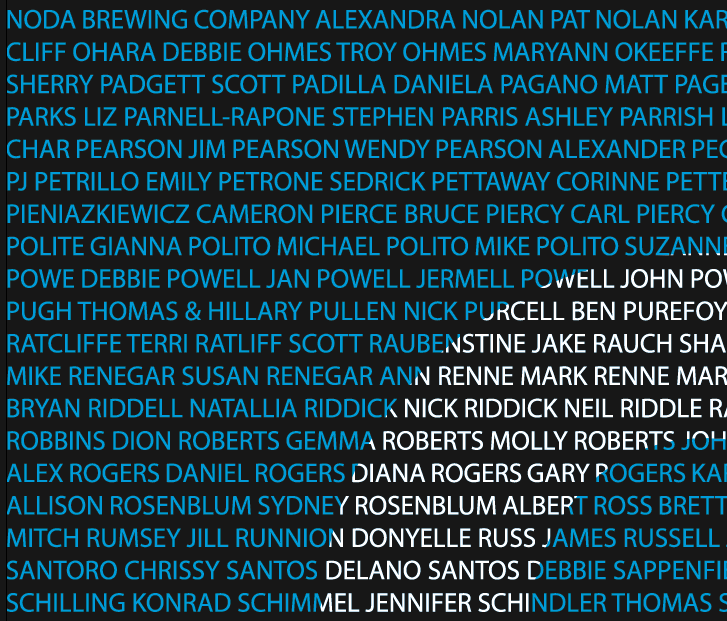 We thought it was a great way to recognize all of you who deserve the real credit for making a difference. Thank you all for being a part of the Roaring Riot. Zack Luttrell is the Ringleader of the Roaring Riot. He enjoys tailgating, dreaming of tailgating, thinking of ways to tailgate more/better, and chasing his son Raymond and daughter Reese around the house.